Changes in body composition, especially in skeletal muscle, are key elements in the ageing process and in the pathophysiology of chronic illness. 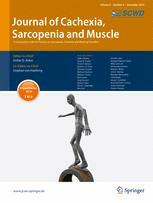 The Journal of Cachexia, Sarcopenia and Muscle presents research on these debilitating conditions, and on body composition and physiological and pathophysiological changes during the lifespan, and in response to disease. Coverage includes research on the functional importance of fat tissue and mechanisms leading to lipolysis, and studies on mechanisms of muscle wasting, as well as better screening and evaluation options and enhanced biomarkers through validated complementary investigations. The Journal is a reliable resource on clinical care, including patients suffering from AIDS, cancer, chronic heart failure, chronic lung disease, liver cirrhosis, chronic kidney failure, rheumatoid arthritis and sepsis. The Journal of Cachexia, Sarcopenia and Muscle benefits physicians, biochemists, biologists, dieticians, pharmacologists, and students. Does IGFR1 inhibition result in increased muscle mass loss in patients undergoing treatment for pancreatic cancer?